The North Atlantic Treaty Organization saw its 70th anniversary on April 4th, and may very well be the most successful alliance in history. Despite a record of successfully deterring a third world war and supporting European integration, Americans can be dismissive of the Alliance and discount its utility. The United States regularly complains their NATO allies do not contribute enough to their own security in Europe—whether measured in meeting the two percent of gross domestic product commitment or having sufficient forces equipped and ready for operations. These complaints have merit, but they are not worth discounting the Alliance or moving away from it. NATO has enabled and supported U.S. foreign policy since the early days of the Cold War and continues to do so today. Given the 2018 National Defense Strategy’s emphasis on the return of great power competition, NATO’s importance to the United States will grow as competition intensifies. The United States should consider reinforcing NATO and reassuring its NATO allies of continued American commitment. This would maintain NATO as a resource for implementing U.S. foreign policy. NATO was a primary mechanism for the United States to balance against the Soviet Union and prevent them from strengthening their hand in Europe, which was central to the policy of containment. For the United States, NATO was a way to deter Soviet aggression and deny Soviet expansion into Western Europe. Early on, it became clear the Soviet Union and its former allies would find themselves on opposing ideological sides. Winston Churchill expressed the West’s trepidation toward Soviet intent when he described an “iron curtain” descending across Europe, dividing free and liberal Europe from European capitals under Soviet control. In the emerging bipolar structure of the international system, the United States looked to secure its position and national interests against the world’s other superpower. This was one of the factors for early U.S. support for NATO. Even before the Korean War and United States Objectives and Programs for National Security 68 (better known as NSC 68), which established the policy of containment, the United States had already begun looking for ways to limit the expansion of communism. Soviet actions against self-determination in Eastern Europe was taken as evidence of malign intent, and U.S. support for Greece and Turkey was an early opportunity for the United States to counter Soviet machinations. In a 1947 speech, President Harry Truman defined U.S. support for Greece and Turkey and outlined a U.S. policy that sought to protect the fragile liberal regimes of Western Europe from Soviet expansion as they rebuilt physically, socially, and politically. This policy, the Truman Doctrine, directly tied European and U.S. national security. As this and other early Cold War crises defined the bipolar U.S.-Soviet relationship, the United States used NATO to bolster its policy of containment. Extending containment led the United States to support accession of Greece and Turkey into NATO during the first round of expansion in 1952. This protected the southern flank of Europe by extending the alliance’s collective security agreement to the Balkans and denied Soviet further access to Europe and the Middle East. This early use of NATO would become the blueprint for enacting the policy of containment through the expansion of the alliance. The “unipolar moment” that ensued after the fall of the Soviet Union saw the United States wield unrivaled power. The bipolar structure of the international system that largely defined the Cold War’s geo-strategic environment no longer existed. Instead of U.S. policy containing communism and the Soviet Union, it looked to use American power to promote democracy and liberal values many saw as universal, and NATO lent legitimacy to the use of American force in the aftermath of the Cold War. NATO was a willing partner in the Balkans during the 1990s, and the Alliance followed a familiar pattern throughout the decade. The United States led numerous international interventions centered around collective action in concert with its NATO allies. The first Gulf War and interventions in Somalia, Bosnia, and Kosovo all fit this pattern. Kosovo exemplifies the U.S. approach to NATO at that time. Kosovo was NATO’s first war and a vehicle to apply American power after the Cold War. With no overarching threat focusing U.S. foreign policy, American interests expanded. The United States again saw its security intertwined with that of Europe’s and sought to maintain regional security in Europe while protecting human rights and values. The new twist was the protection of human rights, and the genocide in the Balkans threatened both. The decision to use force in Kosovo was controversial, and the United States faced opposition at home and internationally. Still, the United States led NATO operations in Kosovo, providing the architecture for the military campaign and conducting most of NATO’s airstrikes. NATO provided legitimacy for the American use of force in the unipolar moment. When the United States was unable to secure a United Nations authorization to use force in Kosovo, NATO became the best avenue to employ force with international legitimacy. Through NATO’s interventions in Kosovo and Bosnia in the 1990s, the United States was able to pursue its foreign policy interests while giving NATO a raison d’être in the absence of the Soviet threat. Al-Qaeda’s attacks on 9/11 changed that and led NATO to return to its original collective defense mandate. Al-Qaeda’s attacks against the United States on September 11, 2001, led much of the world to rally with the United States in support. This included the only time in NATO’s history when it invoked Article Five of the North Atlantic Treaty—that an attack on one is an attack on all. NATO members Canada, Denmark, France, Germany, and Norway joined the United States and Australia in the early offensive operations in Afghanistan. These initial NATO elements eventually expanded into the International Security Assistance Force and supported Operation Enduring Freedom across Afghanistan. The expansion of NATO support helped to mitigate the lack of U.S. forces due to the U.S. invasion of Iraq in 2003. At its height, over 130,000 troops supported the NATO-led International Security Assistance Force mission, which included security force assistance, reconstruction, and counter-terrorism operations. These were missions central to the U.S. approach during Operation Enduring Freedom. The International Security Assistance Force, in and of itself, was not decisive in Afghanistan, but it did buy strategic space for the United States to fight two simultaneous wars in Afghanistan and Iraq simultaneously as part of the Freedom Agenda. Americans should keep these events in mind and look to strengthen the Alliance in this emerging period of great power competition. Doing so would assure America’s NATO allies, help deter Russia, and preserve a vehicle to further American interests. The United States can strengthen the Alliance by demonstrating a renewed commitment to regional security. No one suggests a return to the U.S. military footprint of the Cold War or the 1990s, but augmenting the rotational forces in Europe with permanently stationed capabilities may serve this purpose. Increasing the capability to expand the U.S. presence is a sound option to strengthen U.S. ties to NATO. Returning a land command and control capability, like that of the Army’s V Corps, which inactivated in 2012, would signal greater U.S. capacity for contingency operations in Europe. The United States maintains a similar capability for air assets in Europe, and restoring a land capability would be a reassuring step. Additional land-based fires capability would support deterrence. A land-based fires capability would speak to the potential for a greater U.S. military presence, if necessary, in Europe. Russia has a significant artillery capability that would challenge NATO forces in a crisis, and a U.S. artillery capability in Europe to counter Russia’s tactical advantage would further reassure U.S. allies and support deterrence. Stationing a fires capability in Europe also enables the U.S. military to have an intermediate-range fires capability on the ground once the United States completes withdrawal from the Intermediate-Range Nuclear Forces Treaty. This is important, because, in a crisis, the United States may not be able to deploy adequate forces to Europe without increasing the risk of miscalculation and inadvertent escalation given the danger of these weapons and the fear they instilled prior to the INF Treaty in 1987. U.S. allies in Europe may also balk at the option to deploy a missile deployment during a period of increased tensions. Placing these capabilities forward is a way to reinforce NATO and posture the United States to compete in the latest period of great power competition. The NATO alliance has been a key element of U.S. foreign policy since its founding in 1949 and has enabled U.S. foreign policy throughout its 70 years of existence. Given a return to great power competition, a strengthened NATO can be a decisive advantage for the United States in Europe and elsewhere. Neither Russia nor China have an alliance or partnership that rivals NATO, which has been a decisive advantage for the United States in pursuit of foreign policy ends. NATO has been key to U.S. national security and self-interest suggests the United States should strengthen and enhance the Alliance. Facing great power competition, NATO may just be the strategic advantage the United States needs to be successful in this emerging period of competition. Irvin Oliver is a U.S. Army officer and strategist. The views expressed in this article are the author's and do not represent the views of the U.S. Army, the Department of Defense, or the U.S. Government. Stephen Collinson, “Trump Is Not the First US President to Bemoan NATO Spending… But No One Did It Like This,” CNN.com, July 4, 2018, https://www.cnn.com/2018/07/04/politics/trump-us-presidents-nato-defense-spending/index.html (Accessed March 10, 2018). U.S. Department of Defense, Summary of the 2018 National Defense Strategy, https://dod.defense.gov/Portals/1/Documents/pubs/2018-National-Defense-Strategy-Summary.pdf (Accessed March 16, 2019). Winston Churchill, “The Sinews of Peace (‘Iron Curtain Speech’),” March 5, 1946, https://winstonchurchill.org/resources/speeches/1946-1963-elder-statesman/the-sinews-of-peace/ (Accessed February 15, 2019). Hamilton Fish Armstrong, “Eisenhower’s Right Flank,” Foreign Affairs, July 1951, https://www.foreignaffairs.com/articles/southeastern-europe/1951-07-01/eisenhowers-right-flank (Accessed February 15, 2019). Charles Krauthammer, “The Unipolar Moment,” Foreign Affairs, 1990, https://www.foreignaffairs.com/articles/1991-02-01/unipolar-moment (Accessed March 4, 2019). P. 173, Walter A. McDougall, Promised Land, Crusader State: The American Encounter with the World Since 1776, 1997, Houghton Mifflin, New York. P. 12, Ivo H. Daalder and Michael E. O’Hanlon, Winning Ugly: NATO’s War to Save Kosovo, 2000, Brookings Institution Press, Washington, D.C.
 Walter Isaacson, “Madeline’s War,” Time, May 9, 1999, http://content.time.com/time/magazine/article/0,9171,24446,00.html (Accessed February 9, 2019). P. 14, Daniel L. Haulman, “The U.S. Air Force in the Air War Over Serbia, 1999,” Air Power History, Summer 2015, https://media.defense.gov/2016/Mar/17/2001481638/-1/-1/0/PAGES%20FROM%20AIR_POWER_HISTORY_SUMMER-2015.PDF (Accessed March 4, 2019). Benjamin Schwarz and Christopher Layne, “The Case Against Intervention in Kosovo,” The Nation, April 1, 1999, https://www.thenation.com/article/case-against-intervention-kosovo/ (Accessed March 16, 2019). P. 90, Seth G. Jones, In the Graveyard of Empires, Norton Press, NY, 2010. Paul R. Pillar, “Breaking Down the Freedom Agenda,” National Interest, January 5, 2014, https://nationalinterest.org/blog/paul-pillar/backhanded-democratization-the-middle-east-9669 (Accessed April 2, 2019). U.S. Army Press Release, “V Corps Inactivates After Nearly a Century of Service to the U.S. Army,” Army.mil, June 12, 2013, https://www.army.mil/article/105339/v_corps_inactivates_after_nearly_a_century_of_service_to_us_army (Accessed April 2, 2019). U.S. Air Force Press Release, “603rd Open Doors to New AOC,” Af.mil, October 13, 2011, https://www.ramstein.af.mil/News/Article-Display/Article/304313/603rd-opens-doors-to-new-aoc/ (Accessed April 2, 2019). Dan Gouré, “The Artillery Systems That Could Be Future Command’s First Big Success,” Real Clear Defense, January 28, 2019, https://www.realcleardefense.com/articles/2019/01/28/the_artillery_systems_that_could_be_futures_commands_first_big_success_114144.html (Accessed April 2, 2019). U.S. Department of State Press Release, “U.S. Intent to Withdraw From the INF Treaty,” State.gov, February 2, 2019, https://www.state.gov/secretary/remarks/2019/02/288722.htm (Accessed April 2, 2019). Andrew E. Kramer and Megan Specia, “What Is the INF Treaty and Why Does It Matter?” New York Times, February 1, 2019, https://www.nytimes.com/2019/02/01/world/europe/inf-treaty.html (Accessed April 2, 2019). 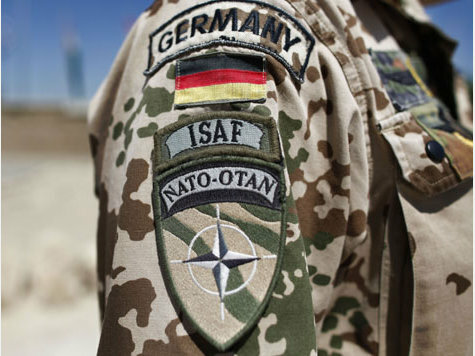 Gustav Gressel, “Russia, Germany, and the INF: Will Berlin Break Its Silence?” European Council on Foreign Relations, February 6, 2019, https://www.ecfr.eu/article/commentary_russia_germany_and_the_inf_will_berlin_break_its_silence (Accessed April 2, 2019).